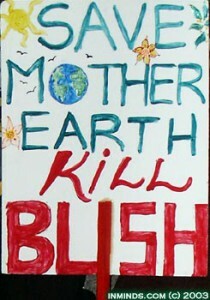 « Thou Shalt Not Build Dams – Ever! The hate speech from Sarah Palin is truly shocking. Her liberal opponents would never dream of saying anything hateful about her. She is so outrageous! She just encourages violence! Likewise for all those Tea Party types. Why can’t they be nice and invite their liberal neighbors around for a friendly debate? I am sure they would be delighted to accept. What you need to understand David, is that liberals are smart and sophisticated, they understand metaphor. Obama can say things like “If they bring a knife to the fight, we bring a gun,” (his words at a Philadelphia fundraiser, 2008) and of course his clever followers understand that he’s not really talking about shooting people. “Never retreat, instead RELOAD!” , they just go get a gun. She shouldn’t be allowed to say such things. Liberals know that a bumper sticker like the one below is just a joke. It couldn’t be serious – it’s just a very clever play on words. But probably a bit of a challenge for the type of people who go to Palin rallies. 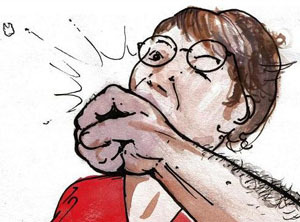 Likewise, an image such as this one which is part of a series called MILP (Mothers I’d like to punch) involves a humorous juxtoposition of the words “mother’ and ‘punch” and is just an entertaining way of expressing a deep understanding of the stupidity of those who can’t see the sinister nature of Palin’s views. And how clever is this?! And here’s a YouTube mashup of a bit of liberal word play – far too advanced for Palin types to get their heads around, of course. It just wouldn’t be possible to engage in anything as sophisticated as real debate with them because their grasp of the language, and their conceptual of the world in general is just far too limited. 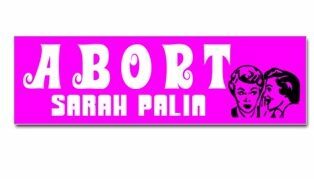 The stupid thing about liberals’ attitude to Palin is they seem to desperately WANT a boogeywoman. They seem genuinely scared that she will be President one day, forgetting that she couldn’t even get her own nominee elected Senator in her home state! I suppose fear and loathing beats systematic analysis of how to win.